Measuring The Equity Bubble - "You Are Here"
In this brief note, we wanted to update our value indicator for the S&P, after the steep consensus upgrades to US earnings and US GDP that followed the US tax reform. We assess how big of an improvement should we see after the reform, assuming a GDP growth of 3.40% in 2018, which is the average of the 10 highest analysts’ forecasts surveyed by Bloomberg, and assuming a 26% jump in earnings in 2018, again at the top end of surveys. We conclude that, against such most generous estimates, the ‘Peak PEG’ ratio for the S&P improved by almost 10%, or, rephrased, it is almost 10% off peak. It follows that the S&P is now above historical averages by a mere 57%. The ‘Peak PEG’ ratio is a variation of the Shiller P/E and the Hussman P/E indicators. It measures the price-earnings to growth ratio (PEG ratio) not for a single stock but for the market as a whole. 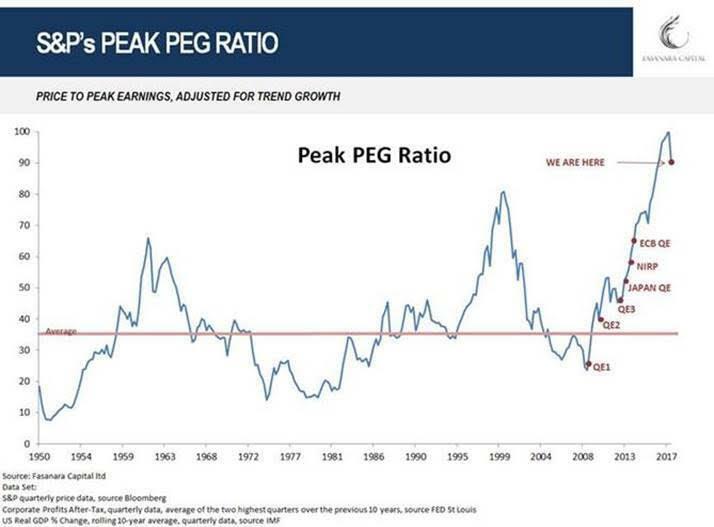 The ‘Peak PEG ratio’ is a price to peak-earnings multiple, adjusted for long-run trend growth. It considers the highest (rather than average) earnings over the previous 10 years (top 2 quarters on the last 40) and then divides for growth potential. It uses top earnings so to conservatively assume the best profit generation capability for stocks in a decade to persist, thus defusing a common critic to the Shiller P/E. It uses GDP trend growth so to proxy earnings growth potential, which is highly correlated to it over time. The concept is simple when applied to single stocks: we are willing to pay more for a stock, in multiples terms, if the growth potential is high. Similarly for the market in aggregate, we should be willing to pay more at times of higher growth potential. This metric is in line with most other valuation metrics ever used in modern financial markets (‘Buffett Indicator’ market cap on GDP, median debt on total assets, corporate debt to GDP, price on sales, price to book, enterprise value on revenues, enterprise value on EBITDA, financial assets on disposable income, Shiller CAPE) in pointing to current markets being more expensive than at any point in history except year 2000, while it disagrees on year 2000, which this metric also deems cheaper than current markets. Analysts estimate that the tax reform will benefit US growth for approx. 0.8% of GDP in 2018 (consensus). GDP growth in 2018 is then projected at 3.40% on average by the 10 highest analysts’ forecasts surveyed by Bloomberg. We incorporate that in our ratio. A jump in earnings estimate of 26% in 2018 is then also incorporated, part of it due to tax reform, again at the top end of surveys. This is to say that, on absolute best estimate revisions for GDP and earnings in 2018 after the Tax reform, the S&P is now 10% less expensive than before, at just 57% above historical average. A definitive improvement, or the lipstick on a pig? Viewpoints. Anecdotally, the valuation gap could also be filled from beneath, with GDP and earnings advancing further. To justify current valuations on this metric - ballpark figures - it would take 3/4 years of US GDP at 10%, or earnings doubling within 2/3 years. As we speak, bond yields are fighting to break multi-decades downtrend lines. The US Treasury yield at 2.61% is right at breakage point, according to bond royals Gundlach and Gross. Both 2-year Treasuries and 10-year US Breakeven Inflation rates are now comfortably above 2%, after rising relentlessly in the last few months (by respectively 70 and 40 basis points). Dividend yields are now below bond yields. 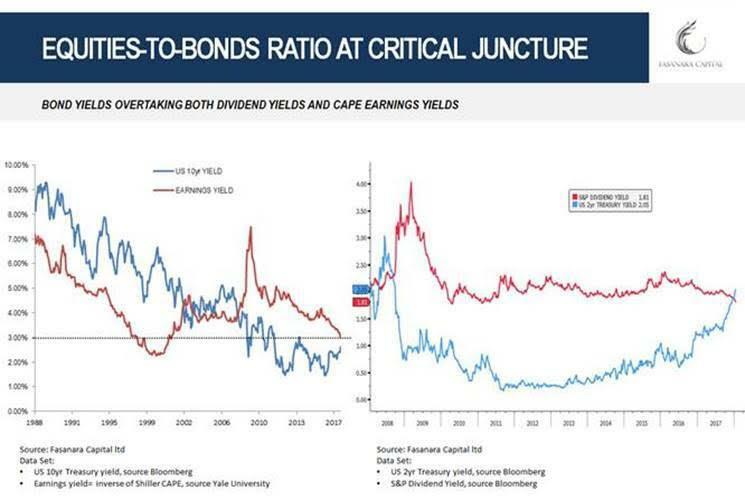 The rally in equities compressed dividend yields, all the while as bond yields rose to recent highs, resulting in the two crossing over for the first time in 10 years. In the chart below, current dividend yields are compared to near term yields obtainable on Treasuries. CAPE-projected Earning Yields are now close to bond yields. The reverse of Shiller P/E, or CAPE, can be seen as a prospective Earning Yield for stocks. This yield is currently approaching bond yields of a comparable tenor. In the chart below, prospective earning yields are compared to long end yields obtainable on Treasuries. 2018 will see a liquidity tightening of 1trn in Central Bank flows only (annualised), previously spent in vacuuming global bonds. In tandem, the FED projects four rates hikes. Bond yields will lose a strong tailwind, all the while as the FED runs after inflation and fiscal expansion. An equity-friendly environment of no volatility and zero interest rates is post peak. On volatility, an interesting note of ZeroHedge discusses estimates from various derivatives analyst on how small a VIX move can wreak havoc. All in all, it is reasonable to expect the backdrop environment for equities to be as good as it can possible be, and for equities to be as rich relative to bonds as they can get. A tipping point may be nearing, poising markets for critical transformation. In our opinion, it ends like this. On the impending tipping points for markets due to a synchronicity of enterprise overvaluation, high indebtedness, low cash balances and a drawback in public flows. We discussed these themes in a recent interview with CNBC Squawk Box: Stocks are now in 'complete bitcoin territory,'. In our recent note ‘Fragile Markets On The Edge Of Chaos’, tipping points for markets are analyzed: a phase transition zone, where rare events become typical.